The past few days have seen some misapprehensions being generated on the scheme of gold imports known as the 80:20 scheme. The factual position is being clarified, says an official release from the Ministry of Commerce and Industry. 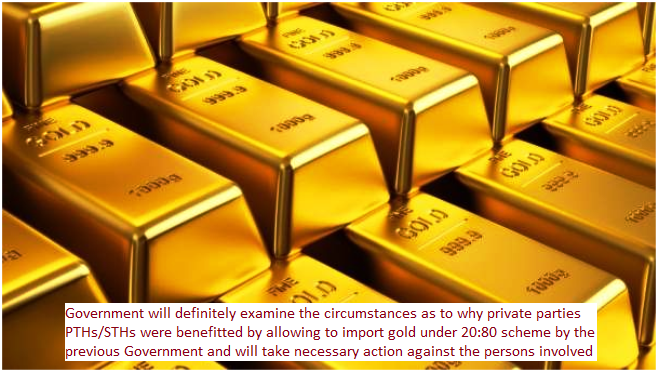 As regards the Unstarred Question No 3700 answered on 13.08.2014, the question was on �Institutionalisation of bullion trade� and the reply was factual in nature stating various measures taken by the Government to institutionalize the bullion trade. The 20:80 scheme was one such measure. As can be seen from the reply, no view on the merit of the scheme or otherwise has been indicated. The allegation of justification for the scheme or allowing PTHs/STHs are completely erroneous. The review of the scheme by the Government was underway and a decision to abolish the scheme was taken in November 2014.